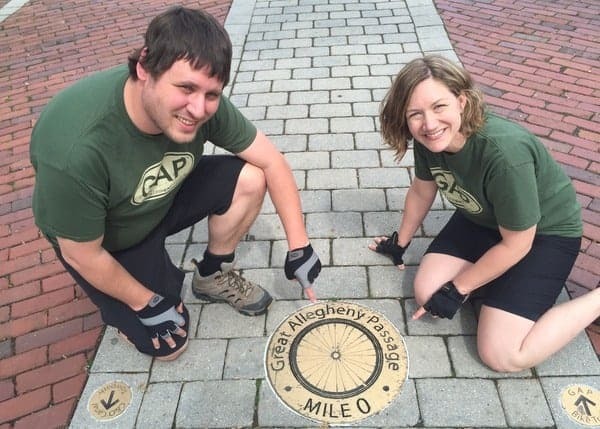 This article is part two in a three-part guide to biking the Great Allegheny Passage. 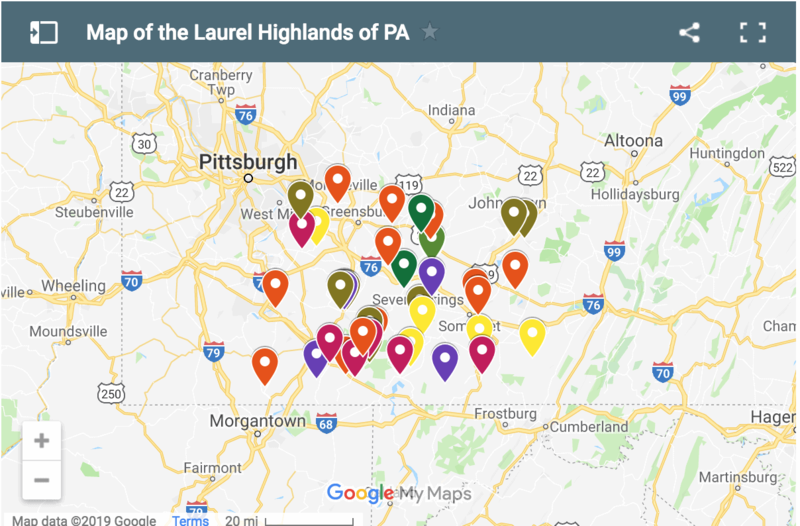 Read Part One: Pittsburgh to Connellsville and Part Two: Connellsville to Confluence. If you’re planning your trip on the trail, don’t miss my top tips for those biking the GAP. 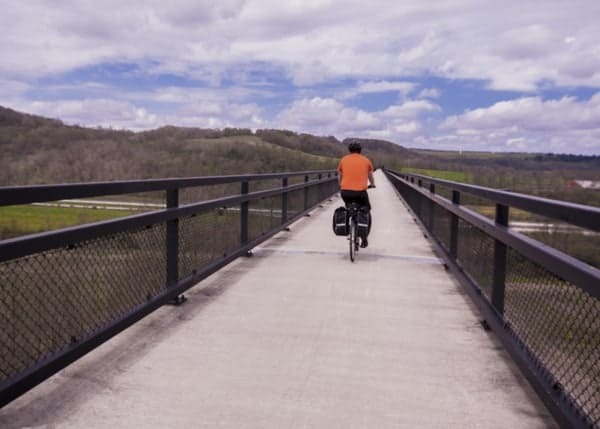 Whether you’re biking the Great Allegheny Passage from Pittsburgh to Cumberland, Maryland, or Cumberland to Pittsburgh, the 62 miles of trail between Confluence and Cumberland will be both the most challenging and the most exciting of the trip. This is because of the elevation that you’ll gain (and lose) over this portion of the trail. If you’ve come from Pittsburgh, you’ve only gained 600 feet of elevation in your first 80 miles. However, in the next 38 miles, you’ll gain 1,000 feet of elevation. While it’s not a steep uphill, the constant climb can get tiring. 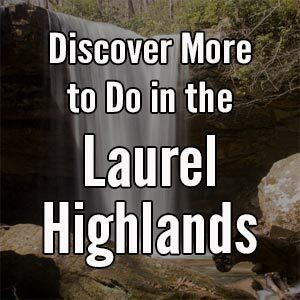 However, once you reach the Eastern Continental Divide at mile marker 24, you’ll have a very fast downhill, losing nearly 1,800 feet of elevation on your way to Cumberland. 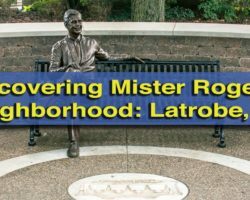 In case you missed the previous installments of this series, I’ve already covered the trail from Pittsburgh to Connellsville and from Connellsville to Confluence. 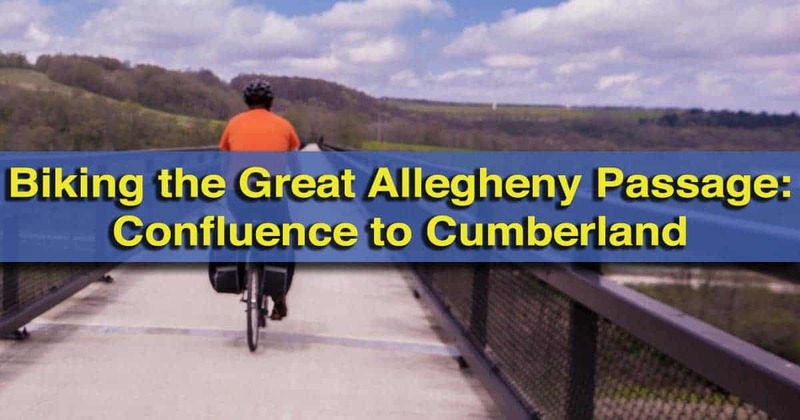 This guide is being written as if you were biking from Pittsburgh to Cumberland, Maryland. However, it works just as well in the opposite direction, with the recommended stops being the same. There are three long tunnels on the GAP between Meyersdale and Cumberland, Maryland. Leaving Confluence, it’s a 31-mile ride to Meyersdale, my recommended place to spend the night. 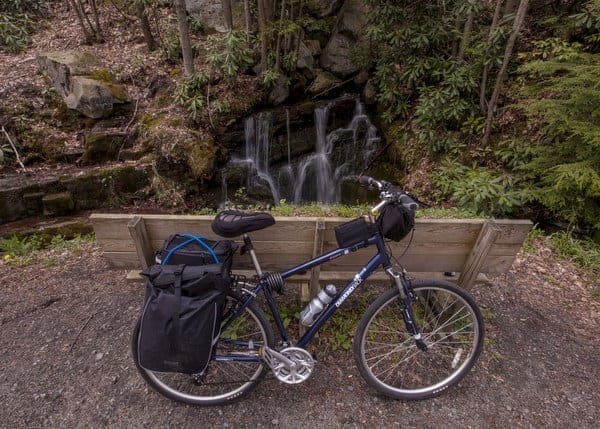 These 31-miles take you in a shape that could be best described as a half circle, as you ride along the Casselman River around the base of Mount Davis, Pennsylvania’s highest peak. This stretch of trail is one of the most remote parts of the GAP, and it’s worth noting that your cell phones are unlikely to work outside of the trail towns. The ride from Confluence to Meyersdale is very scenic, with several bridges crossing the waterway, the first long tunnel of the trip, and even a waterfall. The first major point of interest along the trail is the Pinkerton Bridges and Tunnel at mile marker 52. 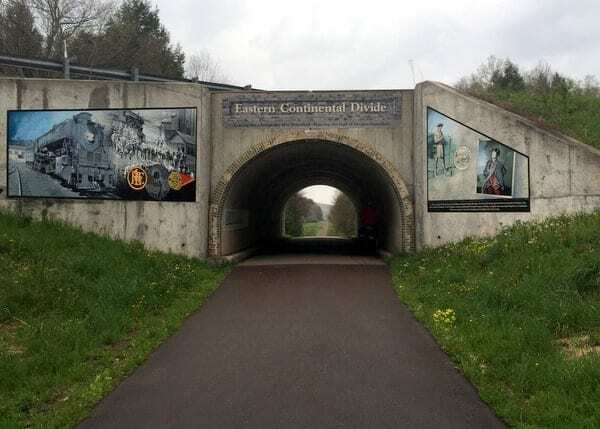 This section of the trail features two bridges over the Casselman River with an 849-foot tunnel in between them. The Pinkerton Low Bridge with the Pinkerton Tunnel in the background. Known as the Pinkerton Neck, this unique piece of land creates a large bend in the river below. The first bridge is known as the Pinkerton High Bridge, while the southern bridge is known as the Pinkerton Low Bridge. This is because of the relative height of the bridges over the river below. The view from these bridges definitely rivals the views from the double bridges in Ohiopyle. 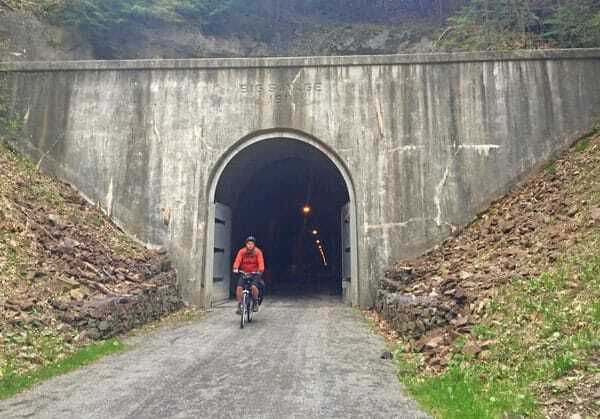 On the Pinkerton Neck there is a tunnel which was opened to bike riders in the fall of 2015. Before that, a 1.5-mile detour along the river was required. While I’ve heard this detour was quite scenic, the tunnel saves riders over a mile in distance and offers another unique feature along the trail. Less than 10 miles further down the trail is the borough of Rockwood. This small town is located across the Casselman River from the trail and has restaurants, a hostel, several bed and breakfasts, and a bike shop. The Rockwood Mill Shoppes is located in a restored opera house and serves good quality pizza. They also offer sandwiches, grilled items, and a variety of locally-made chocolates. Back on the trail, don’t miss the unique art piece and nice overlook of Rockwood that’s located next to the parking area. 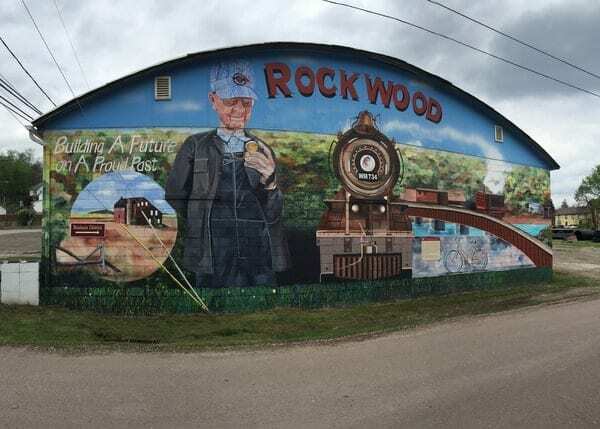 This very cool mural welcomes visitors to Rockwood. From Rockwood, it is 12 miles to Meyersdale, a great place to stop for the evening. On the way, between mile markers 37 and 38, is a small waterfall next to a bench. This makes a great place to rest for a few minutes while enjoying a nice waterfall. 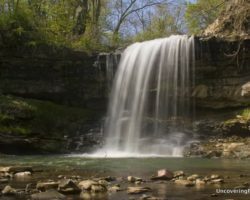 This small waterfall near Garrett is a great place to stop for a short break. Shortly before you reach Meyersdale, at mile 33.5, you’ll come to the Salisbury Viaduct. This 1,900-foot-long bridge carries the trail over the valley below at heights of up to 101 feet. While crossing the viaduct, say goodbye to the Casselman River. From this point on, the GAP forges its own path without any major waterway next to it. After crossing the viaduct, it’s only a mile to Meyersdale. Meyersdale is the highest elevation trail town on the Great Allegheny Passage and offers everything a weary traveler needs to unwind. Along the trail is the old Western Maryland Railway Station, which has been refurbished and now serves as a visitor center and local historical society. The museum is free and does a great job telling the history of the town. During my time in Meyersdale, I was hosted by the Levi Deal Mansion Bed and Breakfast. To say that the Levi Deal Mansion is the nicest place to stay along the GAP is not an overstatement. 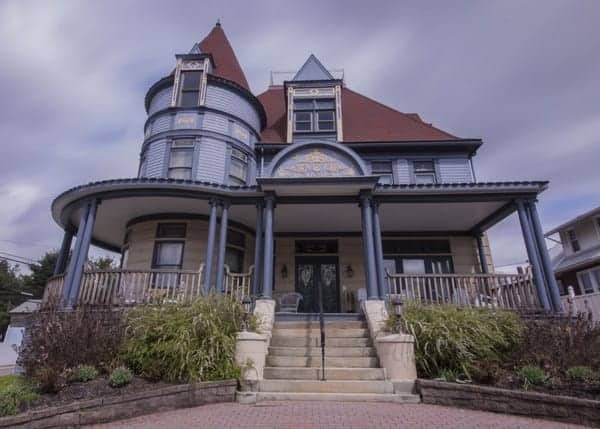 This opulent home was built for an oil and timber baron in the early 20th century and was almost torn down in the 1990s before being revived as a bed and breakfast catering to trail users. Read other reivews of the Levi Deal Mansion on TripAdvisor [Affiliate Link]. 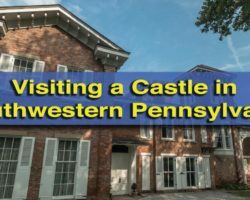 There are many great sleeping options along the GAP like the Levi Deal Mansion in Myersdale, PA. If you stay in Meyersdale on a Sunday or Monday night, dining options are limited, and the innkeepers offer dinner in the home for an additional cost. I was fortunate enough to be able to try the cooking here, and it was quite delicious. If you’re looking for other options, I was told good things about Morguen Toole Co, but did not have a chance to eat there myself. For breakfast, the Levi Deal Mansion puts out a very good spread that will give you great fuel for the road. 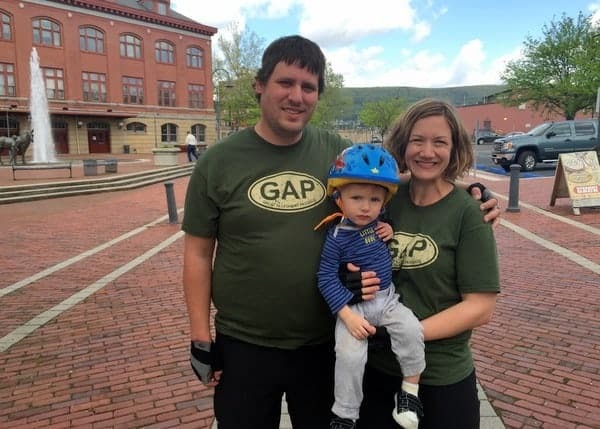 Once back on the trail, it’s 32 miles to the end of the Great Allegheny Passage in Cumberland, Maryland, and roughly 8 miles to the Eastern Continental Divide, the highest point on the GAP. The trail passes over the Keystone Viaduct and through forests on its way to this point. The Eastern Continental Divide is an interesting geological feature. All of the water that falls on the northern side of the divide will eventually make its way to the Gulf of Mexico, while all the water that falls on the southern side will eventually reach the Chesapeake Bay. No matter which way you are biking on the GAP, you are sure to be excited to see the Eastern Continental Divide. This spot is marked by an underpass that has been painted with murals symbolizing local scenes. There is also an elevation chart inside the underpass that shows the height of the various towns along the trail. Whether you’re traveling to Cumberland or Pittsburgh, it’s all downhill from this point. Once you cross over the continental divide, you’ll notice a significant increase in the grade and very little peddling is required from here to Cumberland, 24 miles away. 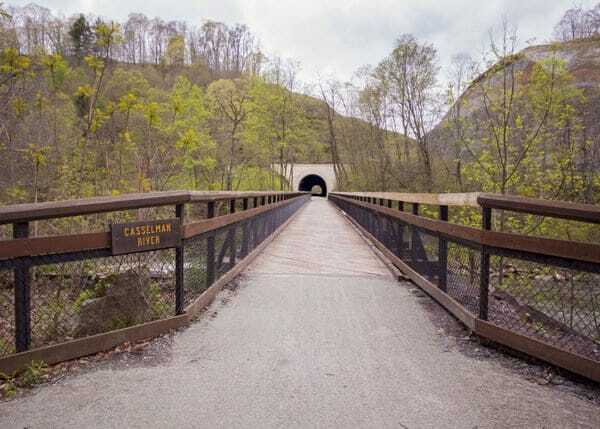 The Big Savage Tunnel is the longest tunnel on the Great Allegheny Passage. A mile and a half after crossing the continental divide, you’ll reach Big Savage Tunnel. This is the longest tunnel on the trail at more than 3,300 feet long. It is lit inside, but portions can be dark. If you have a light, this is where you’ll want to use it. To protect the Big Savage Tunnel from damaging ice, it is closed from roughly early December through early April each year. Make sure that you are riding when the tunnel is open, as there is no easy detour around it. Just after the Big Savage Tunnel is the most commanding viewpoint of the entire Great Allegheny Passage. Make sure to take a few moments to enjoy this amazing view over the valley before heading on. The vista near the Big Savage Tunnel offers amazing views of the valley. The next point of interest is just a mile further down the trail at mile marker 22, where the Mason-Dixon Line separates Pennsylvania from Maryland. A small park has been created here that is worth stopping at. 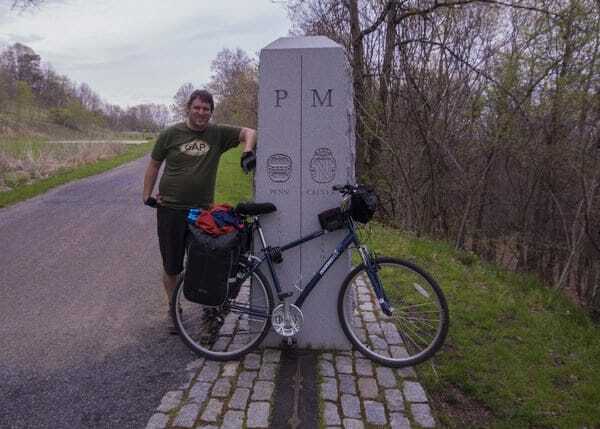 Take a few minutes to read about the amazing history of the survey that delineated the border between these two states and get your photo taken in both Pennsylvania and Maryland at the same time. This markers indicates the line between Pennsylvania and Maryland and makes for a great photo stop. 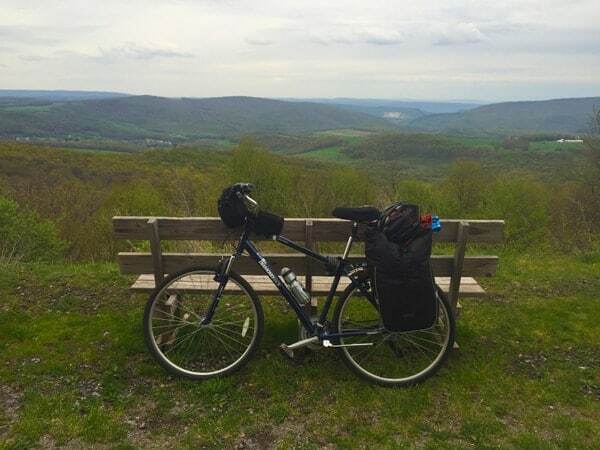 The final 22 miles of the Great Allegheny Passage are in western Maryland. 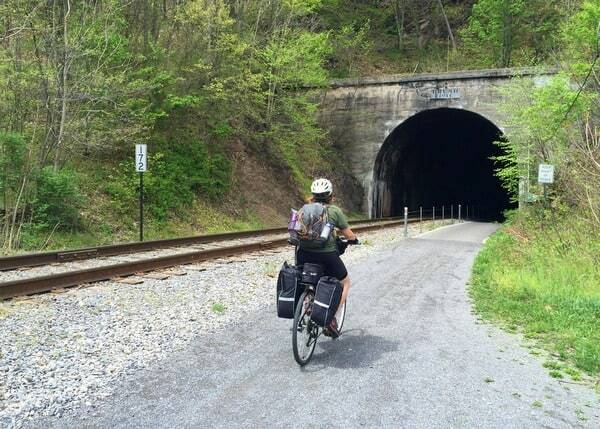 The trail travels through several repurposed railroad tunnels, and picks up train tracks near Frostburg. These are the tracks used by the Western Maryland Scenic Railroad, an excursion train that travels seasonally. 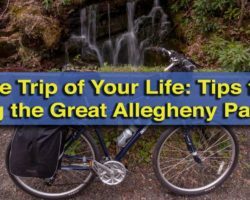 Those traveling to Pittsburgh can ride the train up to near Frostburg and pick up the trail there, skipping over half of the uphill climb. These train tracks will follow along the trail until they reach its terminus in downtown Cumberland. Along the way, the GAP passes through another tunnel, which has signs advising against being in the tunnel at the same time as a train. You’ll also notice that the trail follows the tracks in a series of wide curves. Known as horseshoe curves, they allowed trains to climb large mountains while keeping the grade low enough for the train to operate. The GAP between Frostburg and Cumberland travels along active train tracks. A few miles before Cumberland, at mile marker four, is the Bone Cave. While it might not look like much today, this cave, which was discovered during the construction of the Western Maryland Railway, was home to bones from dozens of animals, many long extinct, including a cave bear and a saber-toothed cat. Just a few miles after the Bone Cave, you’ll find yourself pulling into Cumberland and the end of the Great Allegheny Passage. The trail ends on the sidewalk outside of the restored Western Maryland Railway Station in an area known as Canal Place. My family and I at the terminus of the Great Allegheny Passage in Cumberland, Maryland. A trestle over the trail and a medallion on the ground mark the end of the the Great Allegheny Passage and the start of the C&O Canal. From this point, it’s 184.5 miles to Washington, D.C. If your trip ends in Cumberland or if you’re looking to spend the night here, there are numerous options in this city of 20,000. The Fairfield Inn and Suites [Affiliate Link] is located just a few hundred yards further down the trail and is the most convenient option in the city. You can read reviews of this hotel and others in Cumberland on TripAdvisor [Affiliate Link]. If you’re looking for a good breakfast or lunch option, I enjoyed a nice meal at the nearby Cafe Mark. The mile zero marker on the Great Allegheny Passage. If Cumberland is your ending point, the nearby train station has daily service to Pittsburgh on Amtrak’s Capitol Limited train. Bikes are allowed on this train for an additional cost. You can also coordinate with a bike shop like Golden Triangle Bike in Pittsburgh to provide a shuttle and bike drop off in Cumberland. Cumberland’s Amtrak station is located a short distance away down West Harrison Street. 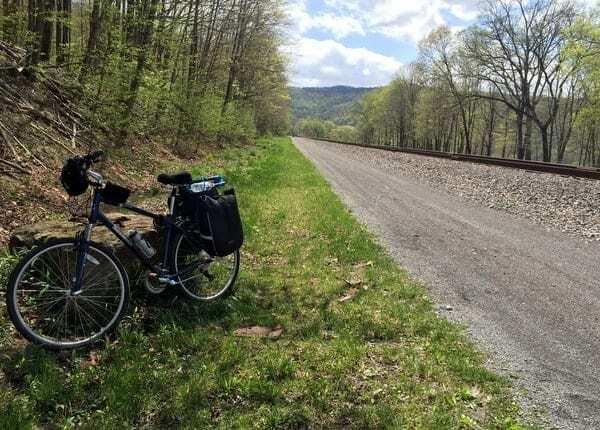 If you’re riding in the opposite direction or missed the first two parts of this series, check out my article about biking the Great Allegheny Passage from Pittsburgh to Connellsville and from Connellsville to Confluence. And, if this is your first time riding the trail, don’t miss my top tips for biking the GAP. I’m considering riding downhill starting from the Continental Divide to Frostburg or Cumberland MD. Do you know if there are any shuttles from Frostbirg that would take you to the closest place next to the Divide, such tHAT we could basically ride downhill, through the tunnels to the Mason Dixon line and beyond?